SB-MD5 Checksum Calculator is a tool to calculate and compare the MD5 checksum of files. The MD5 (Messege-Digest Algorithm 5) is a widely used cryptographic hash function with 128-bit hash value. The MD5 hash is like a fingerprint of a file. SB-MD5 Checksum Calculator is a tool to calculate and compare the MD5 checksum of files. The MD5 checksum is used worldwide for checking the integrity of files. The MD5 checksum has been around for over 10 years. It was designed by professor Ronald L Rivest in 1991. The MD5 algorithm has been used by many security applications and integrity control applications since it was published as an internet standard (RFC-1321) in 1992. 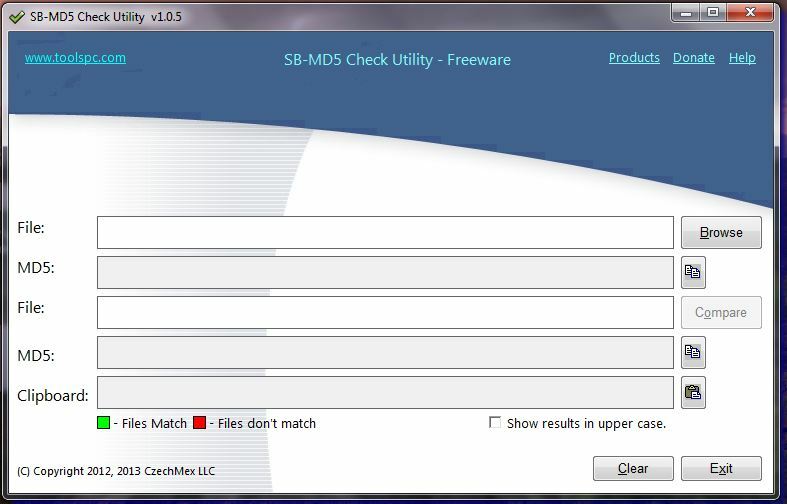 SB-MD5 Checksum Calculator is a tool to calculate and compare the MD5 checksum of files. The MD5 (Messege-Digest Algorithm 5) is a widely used cryptographic hash function with 128-bit hash value. The MD5 hash is like a fingerprint of a file. Features Ã¢â‚¬Â¢Calculate MD5 checksum of a file. Ã¢â‚¬Â¢Compare MD5 checksum of two files. Ã¢â‚¬Â¢Copy MD5 hash to Windows clipboard. Ã¢â‚¬Â¢Compare value from the clipboard with MD5 checksum of a file. Ã¢â‚¬Â¢It is free. The easiest, fastest way to send files to your iPhone, iPad, and iPod Touch over WiFi. It is quick and easy. No configuration required, no need to enter an address to connect. Devices are automatically discovered. Are you finding one of the best OST convert to PST program for new OST Recovery? Here is professional OST2PST 2010 free converter tool want to easily convert OST to PST Outlook 2010/2013/2007 & 2003 file in few clicks with OST2PST conversion utility. Print big image to multiple sheets of paper. For e.g., Print a photo to 2x3 sheets of A4 paper. Database objects stored in a MDF file may be locked for access due to various reasons. You can recover database objects from inaccessible MDF files with a proficient Software SQL Repair. Repair DIVX software is the best software to repair corrupted or damaged Divx files. Using this software we can Repair corrupted AVI, DIVX, XVID video file. Repair DIVX software can easily repair corrupted or damaged Divx files from hard drives. Make in use convenient process of VCF to Outlook Converter for software to convert vcf to Outlook. Conversion process becomes very easier task with batch export VCF to Outlook tool. Bytessence DuplicateFinder is a freeware program designed to detect all the cloned files that you might have on your computer. Outlook Express to MBOX Converter is an efficient program that helps users to do Outlook Express to MBOX Conversion with complete ease. The software provides successful Outlook Express to MBOX conversion solution. This site does not contain serial number, crack, keygen SB-MD5 Calculator serial number : serial number is the simplest type of crack. A serial number(cdkey,product key,etc) is register the program as you may already know. a crack or keygen may contain harmful software. If you cannot find the exact version you want, just give it a try. for more information read .nfo/.txt/.diz file include in zipped file.